If you’ve played many physics puzzle games (or classic point-and-click adventures, for that matter), then you’re undoubtedly familiar with pixel hunting. It’s when you know there’s a solution right in front of your nose that you could find if you just locate the exact pixel the developers expect you to find. That’s not quite the case in Pebble Universe [$0.99]—there are a few pixels that will work at any given moment. But they’re moving. And so are you. Feel like tearing your hair out yet? Don’t get me wrong, here. Pixel hunting reeks of fake difficulty, but the timing you’ll need to perfect in Pebble Universe is very, very real. In any given level you’ll need to launch two pebbles, pebbles that may move at different speeds, down increasingly complex paths so that they smash into each other at the perfect moment. That moment is the one that sees them right beneath the (potentially mobile) soot monsters whose death will do maximum damage. This task gets pretty hard, and it’s worth knowing that up front. Are you the type to patiently wait for your moment, or are you the sort to throw things against the wall? An honest answer will tell you whether or not you’re likely to enjoy this game. I have to give Itatake real credit here. The studio has created a physics puzzle game that doesn’t play like everything else on the market. You might pick up a new skill in Pebble Universe, the skill of timing two objects moving at different speeds down different paths at a glance. That’s something worth adding to your gaming toolbox, you know? It doesn’t hurt that the game also happens to be stupidly cute. The pebbles are tiny, vulnerable, and look as dumb as, well, rocks. They squeak, babble and celebrate every success. The Sootlump monsters are nearly as cute, scared for their lives as they are. Stupidly violent might be another way to describe Pebble Universe. You smash two critters against each other until they explode, at which point their shrapnel shears other critters to bits. As they gib their eyeballs and horns can chain into other monsters. Yep. Eyeballs everywhere. If you’re particularly skilled at blowing things up you can earn a couple awards per level. It’s not quite the three star system we know so well, but it’s not far off. You get one award for reaching a certain score, usually based on how many pebbles you have left when you kill the level’s royal monster. The second award is for destroying all the other monsters before you commit regicide. You will, of course, run into all manner of complex challenges along your path through the game’s two worlds. The level layouts get quite complicated, so you’ll often need to roll one pebble down, over and around a few obstacles before knocking it into its partner. Add to that a few interactive elements like fans, geysers and bouncy sponges and you’re just asking for trouble. 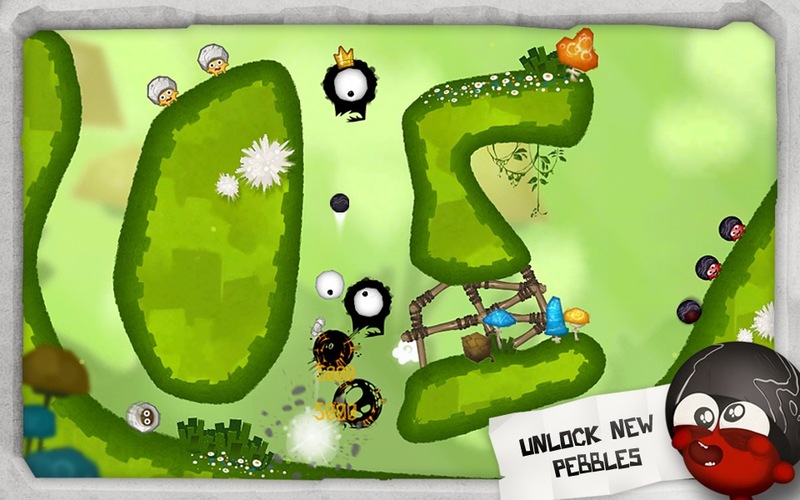 You have a few tools of your own as well—slow pebbles, fast pebbles, sniper pebbles and splitter pebbles, mostly. They’re pre-selected per level, though, so they’re part of the puzzle more than its solution. 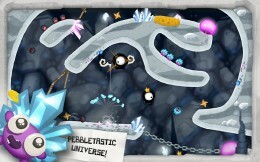 There are 50 levels to work your way through and 6 bonus levels to unlock, so you won’t easily run out of game to play. It sounds as though Itatake has more to come, too. For more of a challenge, work your way up the leaderboards for each world. For less of a challenge, pay a buck to unlock all the levels so you don’t have to. It can be hard to get excited for another physics puzzler, but Pebble Universe does a good job of freshening the genre up. If super careful timing sounds good to you, then you’re probably going to like this game. The folks on our forums certainly do. And really, what’s not to like about throwing rocks at things until their eyes burst out, right? Now there’s a selling point.